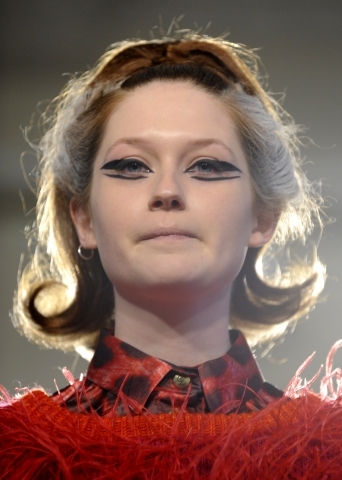 Rather than just attending, Harry Potter actor Bonnie Wright took the catwalk at the Katie Eary show at the 2011 Fall/Winter London Fashion Week earlier today. Photos of Bonnie dressed in Katie Eary clothing, and of partner Jamie Campbell Bower looking on from the audience, can be found in our galleries. Your flavour is chewing gum. You're a risk-taker and like to swim against the current. Bonnie is just so cool (not to mention beautiful). She is both adventurous and comfortable in her own skin. An outfit like this is meant to be outrageous and fun and she obviously got into the spirit of the thing. Oh dear God. I think I almost had a heart attack when I saw this. 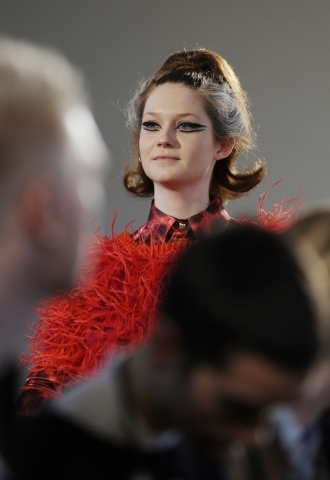 Bonnie is beautiful but what on earth is she wearing, especially those eyelashes? I'm all for having a bit of fun and creativity but you can't tell me anywhere that this is fashion...and the fact that people would actually wear this type of stuff in a regular setting. It's no wonder Jamie looks scared. WOW, I did not recognize her in the far-off shots. I don't like her look her, so as the dress. But this is so interesting. oh well, that's what all this Katie Eary's work had been, all weird. I don't know for which dresses are but definitely people are not gonna dress dress for anything except costume party. For AW11 Katie also delved into womenswear which I'm super happy about. The green sequinned maxi-dress was absolutely stunning and had all the girls backstage swooning. Bonnie Wright of Harry Potter fame was enlisted as one of the female models and she did a great job walking in the ridiculous (but also amazing) heels. Her Twilight actor fiancée Jamie Cambell-Bower was in the front row to lend his support and he was obviously very impressed with his lady, how adorable! Me and my friend think she looks a bit like a hairy ember, but still, she has a way of making that outfit making a bit stylish, and I would definitely wear it (not sure about in public) and Jamie really DOES look scared, but it's adorable that he went, he and Bonnie are gorgeous together. 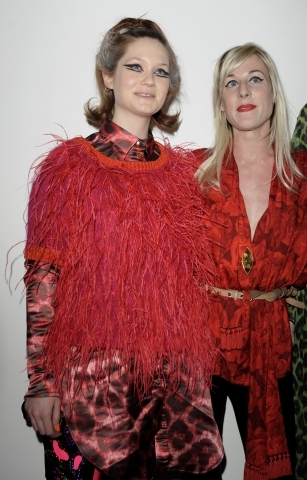 I knew I was in for a treat when I received the invitation for Katie Eary's autumn/winter 2011 show. The invite promised 'the monster walks', and a creepy image of frankenstein's monster, along with some classic spooky fonts which had me intrigued. The collection was said to be inspired by the book 'Elephants on Acid and Other Bizarre Experiments' by Alex Boese (the Frankenstein chapter of course), but there were horror and pop culture references a plenty. The models (both male and female) wore frakenstein bolt jewellery around their necks and some even had 'stitched' up cheeks. The final walk saw all the models strut their stuff wearing giant bunny masks, not unsimilar to the cult character of Frank in Donnie Darko. It's not something you wear everywhere. Its fashion art to be more exact. i am not sooo crazyy about her outfit, i mean it is just not her style from what i have seen in her past pictures and jamie looks scared to death. I dislike that outfit, intensely. "Three Dementor attacks in a week, and all Romilda Vane does is ask me if it’s true you’ve got a Hippogriff tattooed across your chest." Ron and Hermione both roared with laughter. Harry ignored them. "What did you tell her?" "I told her it's a Hungarian Horntail," said Ginny, turning a page of the newspaper idly. "Much more macho." I think he was afraid of the mask they made Bonnie wear. I love her makeup and hair and the outfit was really cool. Almost like a Viviane Westwood. Oh hell, I think my Boggart just changed! Bonnie is beautiful in her own natural way. It is way over done. Jamie does look a little scared. I'm not fond of the clothing, but it looks like fun. Glad that Jamie was there to support her. Wow. I wouldn't have recognized her without knowing it was Bonnie. 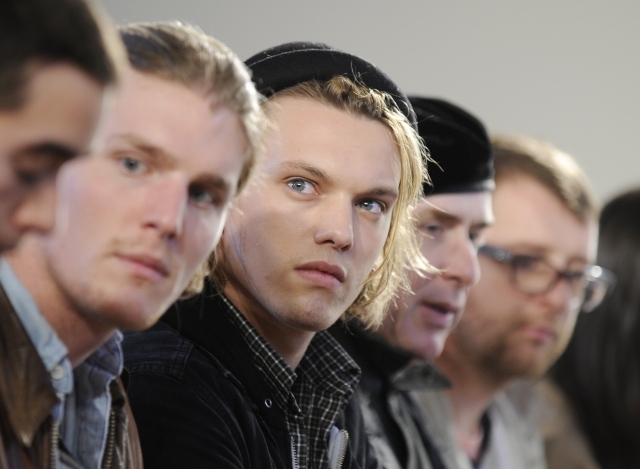 But Jamie's look is priceless!